Washington, D.C. - October 23, 2009 - For the second time this week the Grand Champion cooler was awarded to Confidential at the Washington International Horse Show. Hasbrouck Donovan and Confidential were the winners of this year's Grand Champion Junior Hunter prize, after winning three first place ribbons and claiming the Small Junior 15 and Under Hunter Championship. This is Confidential's second Grand Championship win this week, after earning the co-Grand Amateur-Owner Hunter Championship title with Erin Stewart in the irons. The Small Junior 15 and Under Hunter division was the first to conclude today. Donovan and Confidential won yesterday's first over fences class, as well as today's stakes class with The Joan Robinson Hill Memorial Trophy and the under saddle class with The Rhea Gardere Robinson Memorial Perpetual Trophy. The pair was awarded the Small Junior 15 and Under Hunter Championship, and Confidential was named Grand Champion Junior Hunter, winning The Ides of March Perpetual Trophy. The Small Junior 15 and Under Hunter reserve championship honors were awarded to Genuine, owned by the Chansonette Farm LLC of New York, NY, with Lillie Keenan in the irons. "It feels really good," smiled Donovan. "He went amazing and was unbelievable. I know he's going to jump all the jumps when I go in there, so I feel very comfortable on him. He's really fun and really smooth." Don Stewart of Ocala, FL, Confidential's owner, has been watching the eight-year-old gelding by Baloubet du Rouet very closely for the last two years. "I knew that he had championship qualities because he's a mover and a jumper," explained Stewart. "He's a very top quality horse, I'm sure he could jump a huge course of fences, he's a wonderful athlete. He won the Junior Hunter Finals this summer with Hasbrouck, and my daughter has been champion almost every time she showed him." 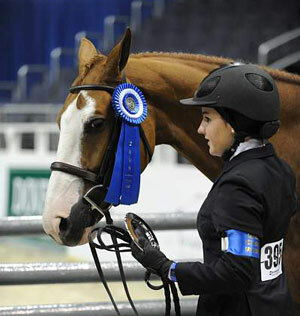 Stewart chose Donovan as a rider for Confidential because her style is very similar to his daughter Erin's, who rides Confidential in the Amateur-Owner Hunters. "Hasbrouck is very accurate and very passive," he noted. "She and Erin are both very soft riders with a nice feel and wonderful timing." The Large Junior 15 and Under Hunter division was next, and the championship tricolor was presented to Samantha Schaefer and Bishonen, owned by Marianna Bishop Wade of Louisa, VA. The pair was the winner of today's stakes class and under saddle class. Donovan took home the reserve championship prize for her ride aboard her second mount, Quality Time, also owned by Stewart. "I had a feeling he was going to be good," noted Schaefer. "'Bishonen is very brave and honest. He's only eight-years-old, so he's got a long road ahead of him, but he's very made for eight. I think that you could put anyone on him and they could get the job done. He's so fun to ride, because he's comfortable and he has a nice rhythm." The Small Junior 16-17 Hunter Championship was awarded to Lyle, owned by Stephanie Keen of Ocala, FL, for the second year in row, this time with Abby O'Mara holding the reins. O'Mara and Lyle had blue ribbon rounds during yesterday's handy class and today's stakes class to earn the top award. The reserve championship ribbon was presented to Kelsey Thatcher, of Bluffdale, UT and Mirasol, who won yesterday's first over fences class. Lyle was recently named Grand Champion Junior Hunter at the Pennsylvania National Horse, and O'Mara was excited to continue the winning streak. "I love riding him, and being champion at any of the finals is exciting," she expressed. "He was a little nervous the first day, but he was still good and we were fourth. Then it just got better the next round, and today he was perfect." Don Stewart found Lyle when he was six years old and he is thrilled to be part of such a legacy. "As a young horse he was quite frisky, but as an older horse, he's 16 this year, he's very easy to get in the ring," he explained. "He's very consistent and careful, and he's got perfect scope and hunter style. He's the whole package, you put him in gear, find him a nice distance and you're pretty much good to go." "You have to be careful though," continued Stewart. "Everybody says always says, 'Oh he's won with so many riders,' but it really takes a certain rider to ride that horse. It has to be an accurate rider with a good feel and smooth riding. He does not like a rough hand at all." O'Mara will continue showing Lyle next year during her final junior year. She is excited to compete at Indoors again, and admits she will be less nervous because she's already been successful once. The final division to compete was the Large Junior 16-17 Hunters. The championship prize was presented to Jennifer Waxman, who was aboard Vida Blue, owned by Laura King of Irvington, NY. The pair received The Chance Step Perpetual Trophy for their excellent performance. Jacqueline Lubrano and Charade, owned by Mahala Rummell of Jacksonville, FL, were the winners of this year's reserve championship honors. "She's so talented," said Waxman. "Sometimes she picks one jump on course that she will jump as a perfect 10. There are only so many horses that can do that and she has a lot of natural ability. If I do my job, she does hers; she goes in there to win." Tomorrow, the Pony Hunter divisions will get underway at the Washington International Horse Show. The WIHS Pony Equitation Classic and the WIHS Hunter Classic Derby will also be held. This week's highlight event, the $100,000 President's Cup Grand Prix, will be held during tomorrow's evening session, beginning at 9:30 p.m. The show runs through Sunday, October 25, and will conclude with the presentation of the Grand Champion Pony Hunter prize and the Best Child Rider Award. 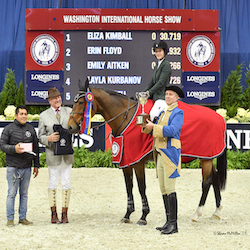 Photo Credit: Hasbrouck Donovan and Confidential were presented with the Grand Champion Junior Hunter Trophy at the Washington International Horse Show. Photo By: Rebecca Walton/PMG. Photograph may be used only in relation to this PMG press release.